I’m very excited to welcome Eva Gates to The Book’s the Thing today. 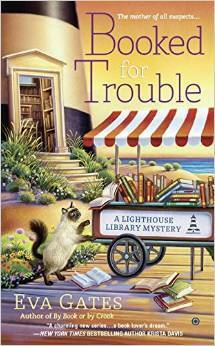 Eva is the author of the Lighthouse Library Mystery series, and has stopped by to answer a few questions. I’ve really been enjoying this series so far, and book #3, Reading Up a Storm, is scheduled to release on April 5th. I’ve already preordered my copy – watch for my review coming soon! I was well established in my career as a computer programmer, and mother of three daughters, when I decided to give it a try. I took some creative writing courses at my community college and discovered that I really enjoyed it. And here we are today. What is your current / most recently completed writing project? My most recent is next week’s publication, Reading Up A Storm, the third in the Lighthouse Library cozy series written under my pen name of Eva Gates. My current project is a new series, the Sherlock Holmes Bookstore and Emporium series for Crooked Lane. The first, Elementary, She Read, will be out in spring 2017. I guess my favourite book is one that came out in 2012 called More than Sorrow. It’s a modern Gothic thriller. These days, I’m concentrating on cozies in my writing career. Do you have any writing rituals that you adhere to? I have a very strict schedule. I write every morning, seven days a week, every day of the year unless I am away or have company. Several years ago, I read an article on how bad for you sitting all day is. And so I decided to give standing up at the computer a try. And I haven’t sat down since. Not only do I now write standing up for my health, but I also believe it really helps with the creative process. If I need a minute to think, I walk around the living room or stand at the window. I use a totally dedicated laptop. I write novels on it, and nothing else. I don’t even write blog posts, and I never access the internet or my e-mail from it. That way, I keep my writing separate from all other computer tasks. Do you experience writers’ block, and if so, how do you deal with it? I don’t, and I think that relates back to the previous question. I have my writing time, so I write in it. Who are your favorite authors / genres / writing influences? I read crime novels most of all. I love the modern Gothics, written by people like Simone St. James, Kate Morton, Carol Goodman. I also like the standard British police procedural such as by Susan Hill or Tana French. I read a lot of Canadian books as well, police procedurals by Barbara Fradkin or cozies by Victoria Abbott. Do your real life acquaintances or experiences ever find their way into your writing? Sometimes, maybe. But that’s secret. Coffee in the morning, tea in the afternoon. What hobbies do you enjoy when you’re not writing? I read a lot. I do jig-saw puzzles. I am just back from a wonderful two week trip to Vietnam. Which fictional character would like to invite for dinner? Why? These days, I think it would be Sherlock Holmes. I’d love to study him for my Sherlock Holmes Emporium series. What book(s) / series can we expect to see from you in the future? April 5th its Reading Up A Storm, by Eva Gates, the third Lighthouse Library book. November, We Wish you a Murderous Christmas, the second Year Round Christmas mystery, and next spring, Elementary, She Read, the first Sherlock Holmes Bookstore and Emporium book. Thank you Eva! I’m a huge Sherlock Holmes fan and will be watching for the Sherlock Holmes Bookstore and Emporium book! 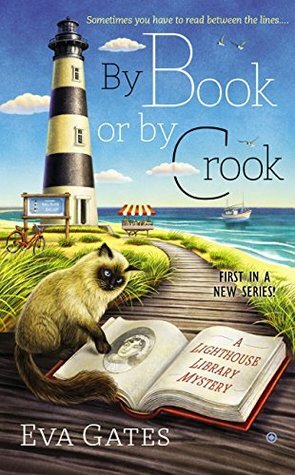 Eva Gates is the author of the Lighthouse Library cozy series from Penguin Obsidian, set in a historic lighthouse on the Outer Banks of North Carolina, featuring Boston-transplant librarian, and highly reluctant sleuth, Lucy Richardson. The first in the series, By Book or By Crook, was released in February 2015. Eva is the pen name of bestselling author Vicki Delany, one of Canada’s most prolific and varied crime writers. For more info, you can check out the rest of the Lighthouse Library Series on Goodreads or read my reviews…. Enjoyed the interview. Sounds like someone I’d enjoy meeting. Love her covers too. I love those covers too!